Internet Scoping School Reviews - Legit or Scam? Internet Scoping School Reviews – Legit or Scam? A profession scopist works as part of a team with professional court reporters. When a court reporter completes recording all their spoken notes and testimony, their notes are given to a professional scopist who uses specialized software to translate the notes from stenotype to written English. It is up to the scopist to ensure that all formatting, punctuation, and grammar are correct, as well as all names and terms spelled and used properly, and they have to be able to flag all questionable areas and return them to the court reporter for review. The Internet Scoping School says that students who successfully complete their program and are able to secure a job as a professional scopist can earn up to $50,000 each year, without a college degree or the students loans that generally accompany a degree. 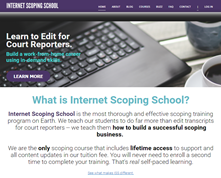 The Internet Scoping School website says that they don’t just teach their students to edit transcripts for court reporters, they teach them everything they need to build their own scoping business and to ensure its success. In addition, the website says that they are the only scoping course available online that includes lifetime access to both support and all content updates directly in their tuition fee, which means you’ll never have to pay for future courses to update your training. Finally, the cost of their course also includes reduced pricing on your Case CATalyst software key, a year’s service contract, and audiosync capability, all of which are necessary to get started scoping. Students who are willing to pay for this entire program in a single payment will be able to enroll in their program for $2,500, or they can break the cost of the program into individual payments for as long as twelve months for a total of $3,000. They also do allow their students to purchase sections of their course individually in case they have previously taken courses that apply to this program. To qualify for purchasing individual course sections, students will need to test out of Punctuation, Medical Terminology, and Notereading before they can be approved to take the abbreviated course. Each of these required tests are priced at $50.00, and if you do not pass the exam this fee can be applied toward the cost of the course. If you do pass these exams, the subsequent courses that you are able to take will be priced between $400 and $500 per section, for a total of $3,300 if you end up taking all the courses for whatever reason. Because paying for the courses individually is more expensive than paying for the whole program all together they ask that customers definitely take the time to make the right choice for their needs before they decide how to approach this program. Internet Scoping School Reviews ? Average Rating for " Internet Scoping School Reviews " is 5 out of 5 based on 1 reviews. I’m just reading this review now, although it’s a couple years old! Just curious as to know if you have any more info on this. I’m on the fence between starting court reporting school or scoping school. I have been reviewing several of these Internet scoping schools. From what I can tell, this school is an excellent school. I also read some student blogging on WAHM.com, which were very good. I am considering the school for myself. I'm very interested to know...a) did you sign up for the course, and b) details and opinions, please!